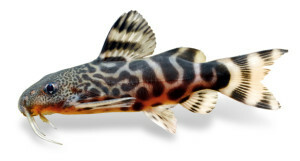 The catfishes of the genus Synodontis, including the “squeakers” and upside-down species, are quite popular among African tropical fish fans, but because of their secretive life they lead a shadowy existence. The captive breeding of most species is still unusual, and we are familiar with the development of juveniles only in a few species, especially with regard to the changing coloration. However, this color transformation can often be used reliably to differentiate similar species from each other. Any successful breeding is a cause for joy. Slightly gravid female Synodontis pardalis. 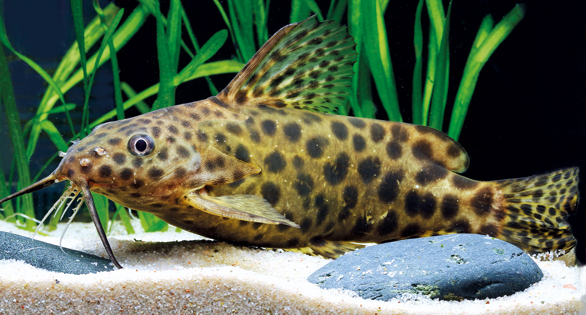 Aquarium Dietzenbach in Dietzenbach, Germany, has succeeded with the husbandry of two Synodontis species that had not been reported previously: S. pardalis and S. waterloti. 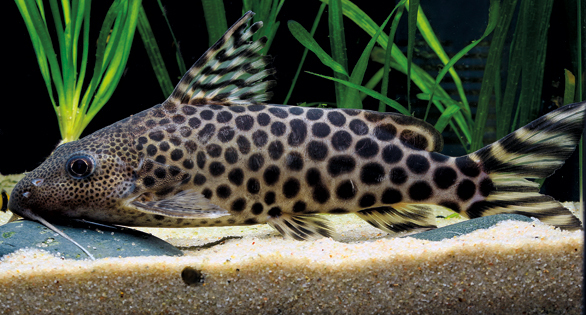 Synodontis pardalis Boulenger, 1908 is a medium-sized (about 10 inches/25 cm) and very attractive species from the Dja River, a southern tributary of the Congo in Cameroon. Wild-caught specimens have occasionally been imported and offered in small quantities and at relatively high prices for several years. 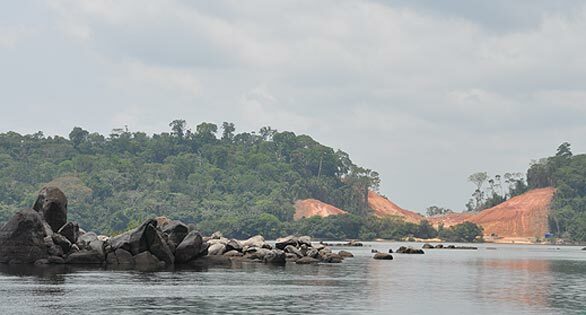 According to the International Union for Conservation of Nature, it is endangered because cobalt mining on the Dja River has caused a decline of its habitat. The patterning varies considerably: in addition to handsome, spotted specimens with a gray-brown base color, I have encountered animals with an olive green to yellow-brown base color. I acquired fresh spawn from Aquarium Dietzenbach to document the development of the young fishes. In both species shown here, development was very rapid in the first days at water temperatures of 77–81°F (25–27°C) and then slowed somewhat. The hatching started after 30–36 hours, depending on the temperature. The tiny larvae carried small yolk sacs, which were absorbed over the next two days. Initially the larvae were glassy and transparent; black pigment started to form in both species when the first food was accepted (freshly hatched Artemia nauplii and sifted Cyclops). Within a few days, the larvae were black and brown and had the typical fin fringe, which transformed into the final fins in the first 10 days. The young of both species were about 0.4 inch (1 cm) long at the time, and their differences, mainly their length, became apparent. The juveniles of S. pardalis grew much more slowly and after about four months, the S. waterloti, which were six weeks younger, caught up (1.2 inch/3 cm total length). This may be because the S. pardalis were already beginning to defend small territories at a size of 0.4 inch (1 cm); this requires a lot of energy, which was not being put into growing. This species is only suitable for large, well-structured aquariums, since large fish can be quite aggressive towards each other. 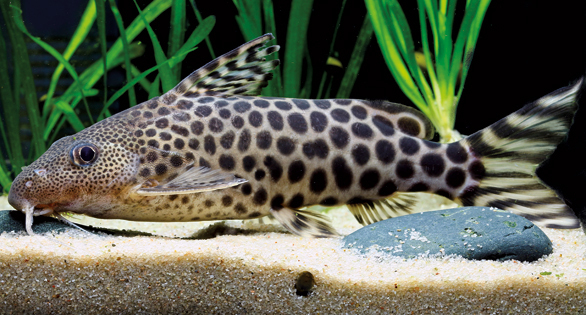 Synodontis waterloti, however, is as peaceful as a lamb, at least when young. The babies always sat together in the caves and shelters, and I observed no aggression in this gregarious species. Whether this changes with age, I do not know. Other aquarists have confirmed that the species can be maintained in a group. 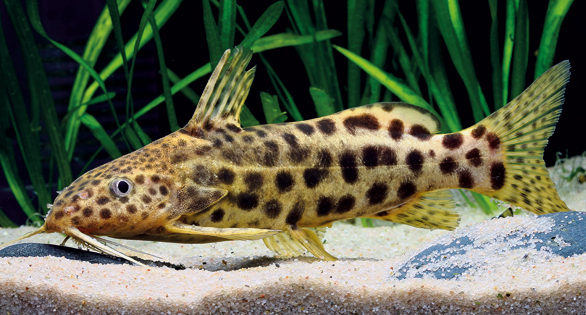 Synodontis waterloti, heavily gravid female. Synodontis waterloti Daget, 1962 was described from Guinea, but it has also been reported from other West African countries such as Ivory Coast, Sierra Leone, Ghana, and Liberia. The maintenance of the 8-inch (20cm) omnivorous fish is relatively straightforward and it is well suited for keeping in large aquariums with other West Africans. In both species, the sexes can be distinguished in well-fed adult specimens. The females are always larger and almost plump when gravid. Not infrequently, mature animals extend their genital papillae, which are tapered in males and appear wider in females. 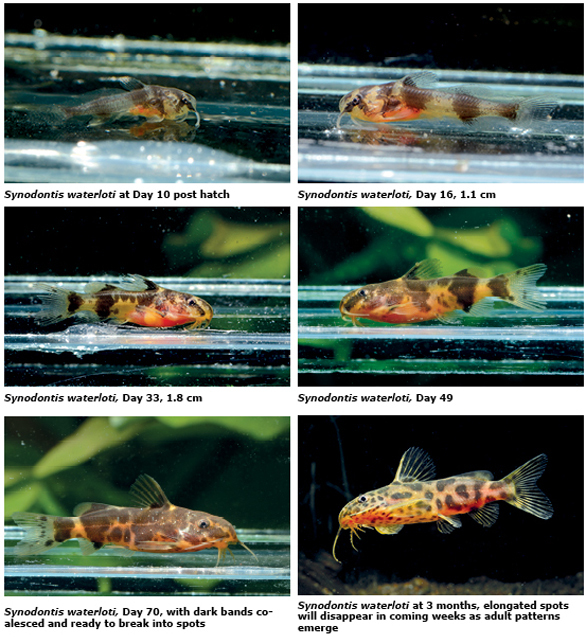 Aquarium Dietzenbach is certainly a pioneer in the breeding of Synodontis. 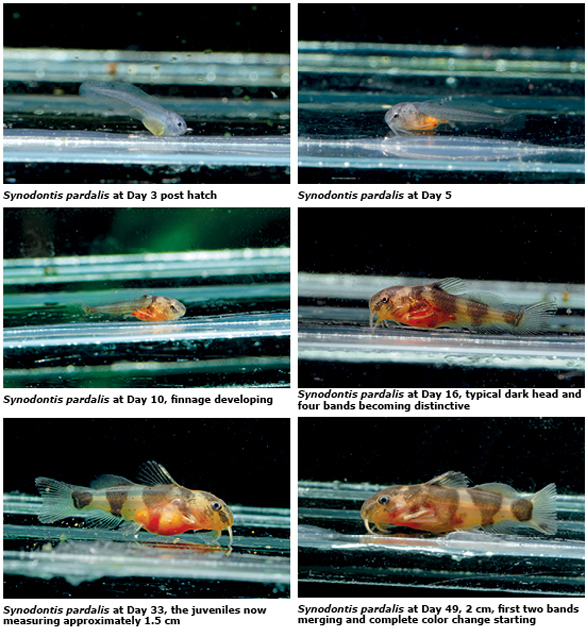 Unlike Southeast Asian or Eastern European hatcheries, where one can never be sure that the fry are not hybrids, Aquarium Dietzenbach only breeds clearly determined species. They have bred more than10 different species in recent years, many of them for the first time. Hans-Georg Evers is the editor of AMAZONAS Magazine. 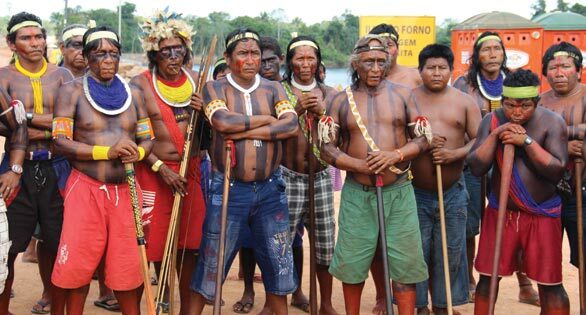 Images Copyright © 2013 Hans-Georg Evers and Amazonas Magazine.